Where else but Orange County can a trio of long-haired, Asian-American surfer dudes build an empire selling Mexican food. But as much I admire the homegrown success of Wahoo's, I do not like their fish tacos because of one very simple reason: the fish must be fried. Charbroiling the fish over flames may cut the fat content and increase its heart-health quotient, but it makes for flavorless, lifeless, dry-as-dust tacos. Deep-frying is the only path to righteousness for tacos de pescado. The folks at Los Cotijas operate on this tried-and-true, time-tested principle. And the result? Well let's just say that your cardiologist likely won't approve. But damn if it ain't one tasty taco! A slender fillet of white-fleshed fish is dunked in batter, dropped into hot grease, and fried until it attains a golden brown crunch. Stop here and you'd have half of what the British serve in their pubs as fish and chips. But wrap it around warm corn tortillas, top with crunchy shredded cabbage, mound on a spoonful of spicy pico de gallo, squirt some tangy, milky-white mayo-sauce and you have the best invention to come out of our Southern neighbors since tequila. Los Cotijas charges you a paltry two bucks for each. And even if the Rubio's chain might charge less per taco, theirs is also smaller in size and lacks the soulfulness of these beauties. And if you think you'll miss the faux thatched roof over Rubio's salsa bar, or the signs pointing south with the distance in miles to Ensanada and Los Cabos, take comfort in this: Los Cotijas' grimy and worn interior is more accurate to what a fish taco joint would actually look like in Mexico. 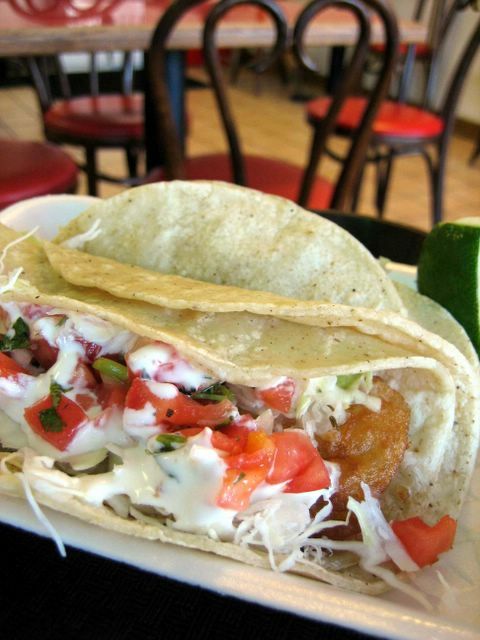 Rubio's was my introduction to the fish taco. I liked it, but, as you said, it wasn't much taco. I have a small appetite, and I still needed two. Good to know there are other options. The best fish tacos ever! Here! Here! For "soulful fish tacos". Sure beats out what comes out of those "chains". I will never understand the utter contempt for deep frying. It can make or break a fish taco. If they were serving salmon with a Vera Cruz sauce, then frying would be inappropriate. But they aren't. I feel the same way about people who express horror at the use of butter, but then use some chemical reaction that simulates butter. Sure, no fat, but Lord knows what those things are doing to your spleen. Anyway, fish tacos don't work at all unless the fish is fried. FRIED! Hi Elmo. This is sort of an unrelated topic and I apologize. I just started a food blog of my own after reading a number of food blogs, including your's. I was wondering if you could give me some feedback on my first review, since I'm still a newbie to the whole food blogging scene. I'd really appreciate it. Love your blog. The Honda-ya superpost really had me drooling, and was what initially inspired me to start food blogging. I was wondering when you were going to do a post about this! Los Cotijas' fish tacos look great. But let's not go overboard bashing Rubio's. I hope you will agree that size nothwithstanding, they still do better than many other places, including ones that aren't mass chains. Two of the more underrated things about Rubio's, IMHO, are the warm, corn tortillas, that are laced with just enough pepper to have a very tasty flavor; and the creamy sauce that I truly believe has crack cocaine in it. The sauce is so good, I never add salsa or pico de gallo to my Rubio's original fish tacos...whereas, I've eaten fish tacos at other places, like Baja Fresh, that I can't consume without soaking in salsa. In a perfect world, Los Cotijas would be on every corner, but Rubio's usually hits the spot until I can get to enjoy the real stuff in Tustin or Santa Ana. Oddly enough, I hardly ever get fish tacos when I go to Wahoo's. And the advantage of Rubio's is that they are all over the place. Sounds like Los Cotijas should expand. Wahoo's is actually quite cool indeed. I like the vibe of the place (at least one of the originals on Bristol and Baker). They've got surf stickers plastered everywhere and surfboards signed by surfers of some acclaim (or so I've heard), and some of the food items are actually decent for what it is, like the ahi rice and the beef enchiladas. Just stay away from those fish tacos! Rubio's fish tacos are better than most, especially Wahoo's, but I need about three to make a meal of them. 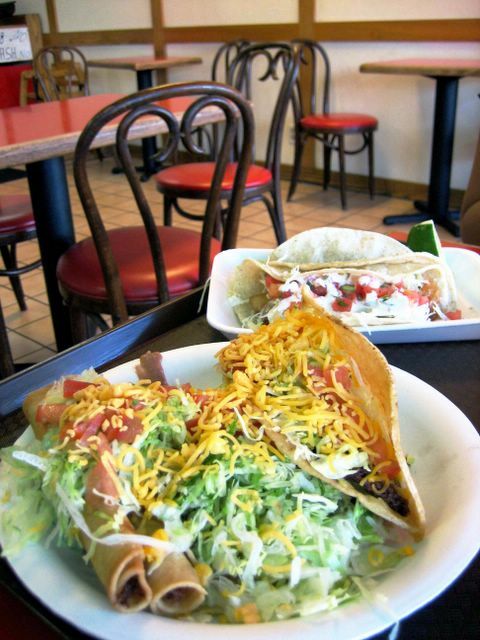 I think two tacos from Los Cotijas would just about put me to sleep. Still the fact that they're everywhere makes them a convenient alternative to your typical fastfood joints like Burger King or McDonald's. But I like these mom n'pop shops like Los Cotijas simply because there's only one of them. Yep, horray for the underdogs! It wasn't easy. When you first told me about it, I went searching but gave up when I couldn't find it. Then I forgot about it until someone mentioned it again. By that time, I was determined to find it and actually put up a post on Chowhound how to find it. I finally did after probably six attempts. What you see here is my first trip. Me too. Fried fish almost wins over grilled fish anyday. Unless I'm in Bali and they're roasting a fresh caught fish on the beach. Then I'll take the grilled fish. Fried. It's how they make it in Baja (or so I've read), and it should be how it's had here. Either way, it just tastes soooo much better! Looks great! I'll be linking you shortly, along with other recent food blogs discoveries! It's about time ain't it. It wasn't because I didn't want to try it sooner, it was because I couldn't FIND it! Glad I finally did. Rubio's does indeed do fish tacos better than most places. I have to admit, I eat at Rubio's often, just because it's really hard to escape them. At the Irvine Spectrum food court, near the Foothill Ranch Edwards Cinemas, at the Block...it seems that where ever I may be when I want to see a movie, Rubio's is there. So I usually end up eating a few tacos to quell my hunger before heading in the theater. And it's better sustenance than the other fast food options that often surround it. And I didn't even mention the Rubio's within walking distance from my office. I like Wahoo's beef enchiladas -- especially when slathered with Mr. Lee's chili paste. Their chicken tortilla soup is also just the type of meal I need when I have a cold. Also, those Maui Onion Rings...greasy and floppy, but man I love 'em. Thanks Elmo. I appreciate it. BTW, I made a blogspot account and moved my post over. It was too difficult trying to tweak Livejournal to get it to do a lot of the things that are built into Blogspot. The new URL for my Curry House post is here. I'm planning to hit the Peruvian Kitchen in Huntington Beach soon. We'll see how their saltado measures up. Did someone say Peruvian Kitchen? I dined there on a Friday night circa February, and thought it was very good. Chubbypanda, if you search the Chowhound archives, there's a review by me buried somewhere. I'm curious to hear an updated report if you go. Peruvian Kitchen is well worth everyone's consideration...especially in summer, with menu items like their citrusy ceviche and passion fruit juice. So that I don't get too far off topic, I'll just say, man, I can sure go for a ceviche taco right now! Dont kill me for mentioning a fastfood place but for a quick and tasty fish taco fix i always head down to del taco. I've had a lot of different fish tacos from a lot of different hispanic areas in LA county and i've found that the fish tacos at del taco fit the bill for a convenient and cheap fish taco. Well I have been eating Los Cotijas for over 13 years! I started at the Los Cotijas in Garden Grove on Euclid street. Ate there almost everyday when I was pregnant in 1992. That's besides the point! Whether it is the fish tacos, beef tacos, taquitos, enchiladas...etc...ya feel me! Los Cotijas has the best mexican food in the OC! I am a latin woman and know excellent authentic tasty mexican food. I encourage anyone to visit the Tusin or Garden Grove location. YUM! I had 2 fish tacos today, and they were soooo good! I was used to Rubio's and Wahoo's fish tacos, and those are so puny in size compared to Los Cotijas'. I was so full when i was 2 bites away from finishing (but i finished it!). Looking forward to your Peruvian Kitchen review. I've been meaning to try it ever since you posted that review. PK's ceviche is on my list for sure. BTW, no need to stay on topic here, this ain't Chowhound! HAHA! I like those Del Taco Fish Tacos too. Surprisingly good for Del Taco! Hits the spot when I've got no other fish taco choices around. I didn't mention in this review that I also tried the combo plate, which was pretty good too. Here's a pic of it. I have to hit them up again soon. I'm getting fish taco withdrawals! Those are indeed big, freakin' fish tacos! Thank you for this great site. When I first moved down to OC from LA I was very disappointed with the lack of restaurant review sites in OC. Then I happen to come across your site. I have found that i visit your site at least once a week. One of my things i missed most about LA county is the mexican food. My favorite fish taco joint is El Taco Nazo.. I swear if you like Los Cotijas you will LOVE El Taco Nazo. there is no comparison. Taco Nazo's fish is cruchy and tasty, also their white sauce is the best! They also have the best salsa. and their grilled chili's, sooo good. El Taco Nazo is currently going through a image change and is changing their name to Senior Baja. When i first started going there, it was just 1 store, now they have expanded to about 15 stores. I found that there is 1 location in Anaheim Hills. I have yet to try that place but oh do i miss Taco Nazo.. Welcome! I'm glad you found my little site. I am actually an El Taco Nazo fan myself. They are my gold standard for fish tacos. I frequent the one in my hometown of Chino Hills, which, just as you indicate, is becoming a Senor Baja. Thankfully, the food hasn't changed. The only thing I wish is that there was one closer to me in Irvine (where I currently reside)...until then it's Los Cotijas for when I get the hankering and can't drive up to Chino Hills. I'm in tustin and this is the closest one i know of, but i haven't had a chance to visit them yet. I found a place with the same great fish tacos and much more variety on their menu not to say much roomier. Its Los Cotijas Mexican Grill in Anaheim on the corner of Katella and Brookhurst. Its interesting you mention Wahoo's, and the asian-american brothers. My family actually knows their family, back when they had a Chinese restaurant. And, to be honest, the food wasn't very good, and at best, was passable. Given how mediocre their Chinese food, I've been pretty skeptical what they could do with fish tacos.